The TCP/IP Guide was subjected to a thorough, multi-stage review and editing process. Unfortunately, all the reviewers and editors were human, and with a tome of this size it is inevitable that a few mistakes sneak through. This page identifies these problems, to help you avoid any potential confusion that may arise as a result. NOTE: These errata are for the book version of The TCP/IP Guide. For errata covering the electronic version of the Guide, please see this page instead. 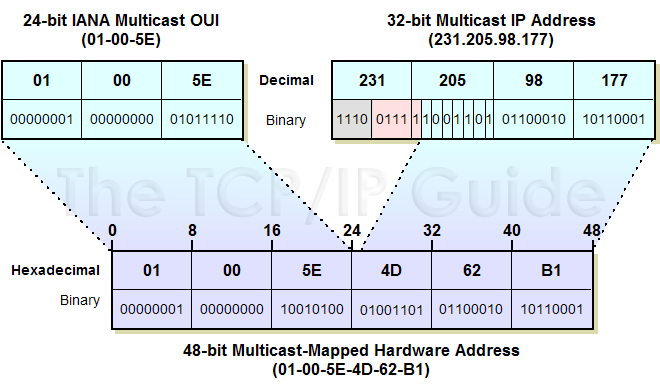 Page 224: In Figure 13-8, the Hexadecimal multicast-mapped hardware address "should be "01-00-5E-4D-62-B1" and the third set of eight binary digits from the right should be "01001101". Please see this online image for the correct figure. Page 293: "The total number of hosts needed is thus 196" should read "The total number of hosts needed is thus 190". Page 312: In Figure 19-8, the last octet in the binary representation of Subnet #0, Host #2 is shown as "00000001" when it should be "00000010". Page 898: "Finally, if an amount of time equal to Expires seconds elapses, the master name server will stop serving data from the zone until it re-establishes contact with the primary name server." should read "Finally, if an amount of time equal to Expires seconds elapses, the slave name server will stop serving data from the zone until it re-establishes contact with the primary name server.". Page 980: "In fact, the successor to RFC 1497 is RFC 1533, which officially merges BOOTP vendor extensions and BOOTP options into the same standard." should read "In fact, the successor to RFC 1497 is RFC 1533, which officially merges BOOTP vendor extensions and DHCP options into the same standard.". Page 987: In Table 60-1, in the row for the field "CHAddr", "address of the client sending a BOOTREPLY" should read "address of the client sending a BOOTREQUEST". Page 11146: In Table 70-1, the encoding "%26" is shown as corresponding to the "%" character; it really is for the "&" character.